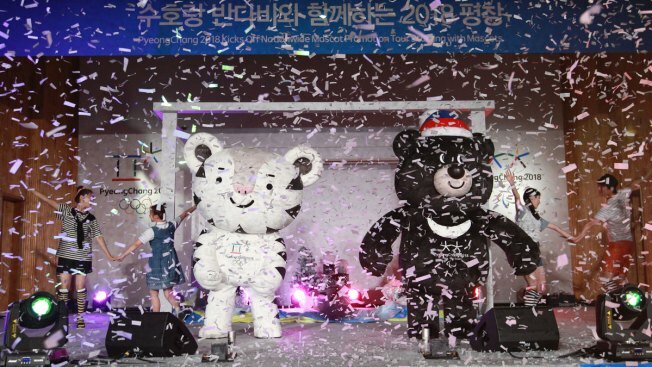 Volunteers dance with the official mascots for the 2018 PyeongChang Olympic and Paralympic Winter Games, white tiger Soohorang, left, for Olympic, and black bear Bandabi for Paralympic, during their launching ceremony at Hoeng Gye Elementary School in Pyeongchang, South Korea, on July 18, 2016. The closing ceremony in Rio will start the clock ticking for 547 days until the next Winter Olympics take place in PyeongChang, South Korea, in 2018. The Games’ nearly finished skating arena, one of six new facilities, will be ready in November to hold test events. At $13 billion, the games will cost nearly four times less than those put on in Sochi — the most expensive in Olympic history. PyeongChang won the bid to host the Games at the third event, having narrowly lost the votes won by Vancouver and Sochi.